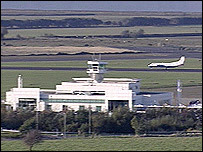 A full independent inquiry is to be held to investigate the four-day closure of City of Derry Airport. The airport was shut on Friday by the Civil Aviation Authority due to a "systematic failure of safety management". It was given the all-clear after a further inspection on Sunday. Announcing the inquiry, Derry City Council said in a statement it regretted the closure, and safety remained "its number one priority". City mayor Helen Quigley said a number of matters needed to be clarified and addressed. "A rigorous review will examine the facts and, most importantly, reassure the general public about the safe future operation of our airport," she said. Earlier, airport chief executive Seamus Devine apologised to travellers. "It's the last thing we wanted to happen and of course we accept a large part of the responsibility," he said. Throughout the weekend contractors were on site completing a number of improvements. These included updating the bird management system by placing nets across culverts and ponds, repairs to the aircraft parking apron and minor drainage work carried out adjacent to the runway. Questions are still being asked about how problems got to such a stage that the airport had to be completely closed in the first place. Londonderry businessman Brendan Duddy said the situation at the airport was "unacceptable". "We in the private sector, we just don't get away with that," he said. "This is public versus private. Derry City Council running an airport? Not on."